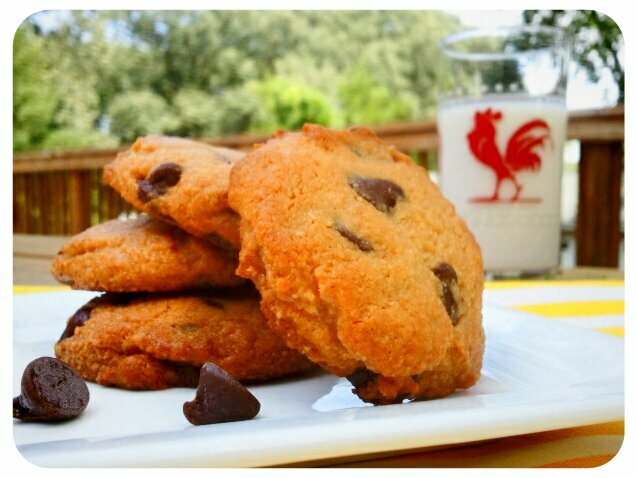 I already have a few chocolate chip cookie recipes, however it’s nice to have one just using almond flour. Great for those who can’t do coconut flour, or simply if you run out of it. Nothing should stand in your way from making chocolate chip cookies when you need them. These are moist, crispy on the outside, but chewy centers. I love them, and so will you! Be sure to firmly pack your almond flour when measuring or else they will spread like pancakes. They taste delicious with either butter or coconut oil. That too is a personal preference. Just use whatever you have on hand! Stir together all ingredients, except chocolate. Fold in the chocolate chips (be sure to wait until the mixture is cooled down… not warm from the melted butter). Scoop onto silpat/parchment lined baking sheets. And flatten the dough. These should not move or spread much during baking. Bake for 18-22 minutes, until golden brown. Remove from baking sheet onto cooling racks. *you may notice there is no baking soda, that is not an error. This entry was posted in Gluten Free and tagged dairy free, gluten free, grain free, paleo. Bookmark the permalink. These look AWESOME!! Now I want some, HAHA!! OK, I just made these cookies for after soccer practice when my daughter and husband come home to a wonderful smelling house. They are perfectly plump, not flat like pancake as I remembered to pack the almond flour. OK, I added a huge tablespoon of freshly ground peanut butter (ey, ey, ey!) and reduced the cooking time by two minutes and WOW are these wonderful. I am in a cooking mood tonight so I just through that peanut butter in and thought, “HOW CAN I GO WRONG WITH PEANUT BUTTER AND CHOCOLATE? ?” Well, I didn’t and these are awesome! Thanks Michelle! I just made these exactly as recipe (w/coconut oil) and they came out completely flayed. Tasted yummy, but flat. Are there supposed to be eggs? These are so awesome. I love all your recipes. A full cookie sheet, haha, not just 12 little cookies. Do we need to half the amount of coconut oil maybe?